Conserving Antarctica: which protected area will it be? Achieving consensus on four proposals for marine protected areas in Antarctica will not be easy. This week delegates from around the globe are gathered in Hobart for the annual meeting of the Commission for the Conservation of Antarctic Marine Living Resources (CCAMLR, pronounced “camel-ar” to those in the trade). They have been presented with four proposals for marine protected areas in Antarctica, but getting even one instituted could be an uphill battle. Australia and France want to declare a series of marine protected areas (MPAs) in waters off east Antarctica; the UK proposes protecting areas when ice shelves collapse in the Antarctic peninsula region; and there are two different proposals – from NZ and the USA – for an MPA in the Ross Sea region. There are currently only two large MPAs in the CCAMLR area. One is in the Australian Exclusive Economic Zone. It is in waters adjacent to Heard Island and was declared by Australia under its domestic legislation. The other, near the South Orkney Islands, was declared by CCAMLR in 2010. The UK proposal to establish MPAs in areas exposed by collapsing ice shelves is designed to allow research and assessment to be conducted before fishing is allowed in these places. The Antarctic peninsula region is responding rapidly to climate change and the past decade has seen the collapse of large ice shelves and significant loss of sea ice. While the US and NZ proposals are superficially similar and overlap considerably, they cover slightly different areas and have different emphases on conservation. But having competing proposals for the same region will make the job of getting agreement for an MPA in the Ross Sea more difficult. CCAMLR relies on consensus to make decisions, and having two proposals competing for the one decision allows members to hide their opposition behind the mask of “uncertainty”. 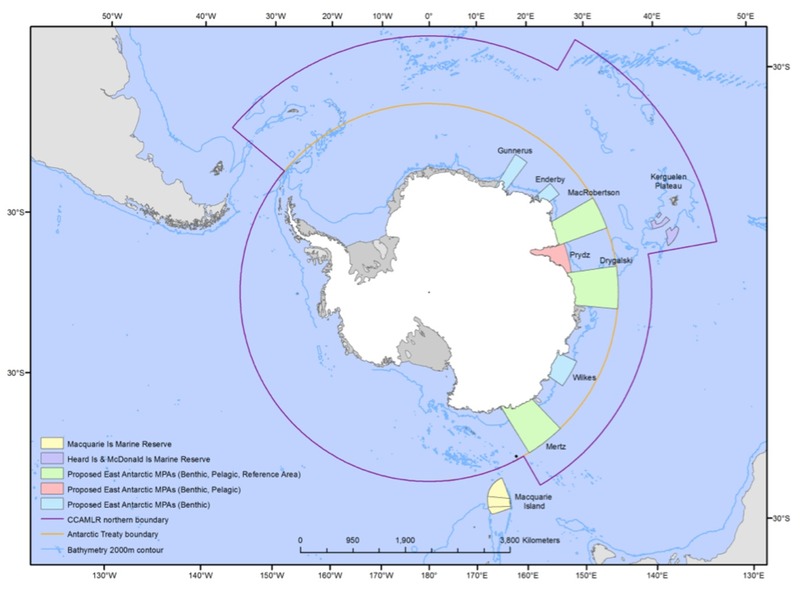 Australia and France have jointly sponsored a proposal to declare seven MPAs in east Antarctica (see Figure 1). The intention is to establish a representative system of MPAs along the Antarctic coast from 30 to 150 degrees east. In total these MPAs would cover an area of almost 2 million square kilometres. They are designed to protect both benthic (sea floor) habitat and pelagic (open water) species, and to provide reference areas which are free from exploitation. Some forms of fishing will be allowed but only if they will not harm the conservation and scientific values of these areas. Three of these areas will be set aside so that studies of ecological processes and climate change can be carried out in large areas free from exploitation. One area will provide important refuges for larval krill, and for fish. Taken together, all the proposals provide a significantly enhanced MPA regime for Antarctica – and the Australian and French proposal in particular establishes a structured regime that can be applied to the rest of Antarctica. MPAs have been on CCAMLR’s agenda for over a decade. During this time areas have been set aside from fishing as part of CCAMLR’s consideration of “open” and “closed” areas for toothfish and krill fishing. But the current round of discussions centres on providing CCAMLR with a representative and comprehensive system of protection of important Antarctic ecosystems. Achieving consensus on these proposals will not be easy. Some CCAMLR members view the commission through the eyes of their fisheries’ interests. In article 2, the Convention that established CCAMLR provides that its “objective … is the conservation of Antarctic marine living resources”, but it also states “for the purposes of this Convention, the term ‘conservation’ includes rational use”. In previous meetings of the Commission some countries have argued strongly that all areas should be open to fishing, and they have opposed marine protected areas on the grounds of “lack of scientific evidence" to support marine protection. CCAMLR is regarded widely as a groundbreaking agreement. It introduced ecosystem-based management and precautionary catch limits to fisheries, and broke new ground in combating illegal, unregulated and unreported (IUU) fishing. CCAMLR is no stranger to dealing with difficult issues but agreement to the MPA proposals is no certainty. The Commission will sit from 23 October until 1 November and it is likely that negotiations over the MPA proposals will continue long into the meeting. It would be a significant achievement if CCAMLR was able to reach agreement on a comprehensive MPA regime for marine areas in the Antarctic in this year’s meeting.